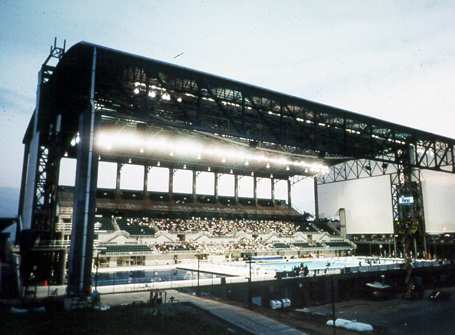 Completed in 1995 to host the 1996 Summer Olympic swimming and diving competitions, the world-class outdoor freestanding venue, designed by Counsilman-Hunsaker, featured a 50-meter by 25-meter pool with two bulkheads, movable floor, and a separate diving well complete with 1, 3, 5, 7&#189, and 10-meter diving tower and springboard diving. The pool was carefully constructed with special design considerations to ensure the proper amount of water flow through bulkheads and the perimeter overflow gutter system. The variable speed recirculation system permitted the operator to maximize surface conditions to provide the fastest possible pool. The placement of floor inlets and the inclusion of anti-wave action floating lane dividers were designed to minimize wave action. Upon completion of the Olympic Games, the facility was also utilized for the Paralympics swimming events.